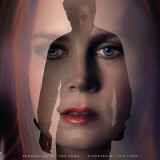 Story Line: An art gallery owner is sent a violent novel from her ex-husband in Tom's Ford intriguing revenge-thriller. Thought provoking, intriguing piece and unique in terms with outstanding performances, stunning photography and a scintillating score. Poor characterisation and a touch of pretentiousness. Nocturnal Animals is a thought provoking and intriguing piece of work and certainly unique in terms of story-telling as it threads hugely disparate narratives together and overtly draws out comparisons between them. Complemented by outstanding performances (Tayor-Johnson and Shannon in particular), stunning photography of the West Texas landscape and a scintillating score, it really is a hugely accomplished effort by Ford who is unfortunately just let down by weak characterisation and an undertone of pretentiousness. Fashion Designer turned Director Tom Ford follows up his 2009 debut, A Single Man, with this intriguing tale of revenge and missed opportunities. Based on Austin Wright’s novel ‘Tony and Susan’, the film features strong central performances by the always excellent Amy Adams and Jake Gyllenhaal, as well as outstanding support from Michael Shannon and Aaron Taylor-Johnson. The premise of Nocturnal Animals is founded on the ‘film within a film’ structure, in which Amy Adam’s art gallery owner, Susan, reads a novel (entitled ‘Nocturnal Animals’) sent to her by her ex-husband, Edward Sheffield. This plays out as a separate story-arc and the two differ greatly in terms of theme, pace, action and even violence; Susan’s world is centred in High Society where money, reputation and credibility are the most important things you can strive for, whilst the novel is based in an almost modern-Western-come-horror setting. Despite this, both narratives cleverly mirror each other and share the aforementioned motif of revenge. As we learn more about Susan, we discover the reasons behind her first marriage breaking down and soon realise that she is a deeply unhappy and unsatisfied woman at home and at work. Suffering with insomnia, the novel sent to her by her ex-husband proves to be more than just a distraction, as she reflects back on their relationship and is personally affected by elements of his story which appear to be influenced by key moments from their shared past. As Susan reads the novel, we follow a married couple and their daughter as they embark on a road trip, driving through West Texas in the middle of the night only to be terrorised by a gang of locals led by Ray Marcus, played by a convincingly unhinged and menacing Aaron Taylor-Johnson. Jake Gyllenhaal is Tony Hastings, the father and husband who must protect his family and who subsequently forms a partnership with the Detective investigating the case, portrayed by the utterly brilliant Michael Shannon. 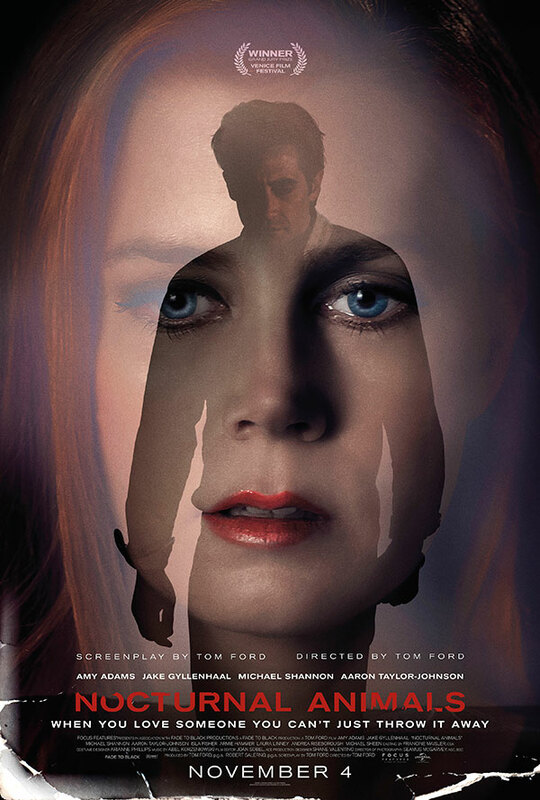 It is this story which proves to be by far the most engrossing and interesting and whilst the links to Susan’s situation are apparent, one could be forgiven for wishing that Nocturnal Animals was solely a dramatisation of the novel within the film. From the first moment Tony and Ray meet, we as the audience are immediately catapulted into a nerve-wrecking and tense confrontation as we watch the two of them face off. We become increasingly nervous by the unpredictable motives of Ray’s gang, and once the confrontation reaches its climax, we are drawn to Tony out of sympathy and empathy. The introduction of Michael Shannon as Detective Bobby Andes not only creates a sense of hope that justice will prevail, but it also treats the audience to a superb, captivating and scene-stealing performance from Shannon. Some critics have applauded Amy Adams’ for seemingly ‘acting with her eyes’, but Shannon is more deserving of that particular observation; his wide eyes, ticks and mannerisms speak a thousand different emotions, thoughts and feelings within his character. Once Shannon’s Detective Andes and Gyllenhaal’s Tony team up, this particular story then turns into a revenge thriller as the two of them seek out those responsible for the events of that first night. On the surface, this tale is in itself relatively generic, but it is driven by the excellent performances. Whilst Shannon certainly stands out, Taylor-Johnson is also brilliant as Ray Marcus; an arrogant, conniving, intelligent and disturbingly captivating young criminal. Of course it is Gyllenhaal who takes top billing here, and whilst this is perhaps not his strongest output, he puts in a solid performance in a dual role as Tony Hastings and Edward Sheffield, the ex-husband and author of the novel whom we see in flashbacks as Susan ponders her past. It is here where the issues with Nocturnal Animals arise, which is ironic as it is this narrative which essentially provides the core foundation of the film itself. Whilst Adams convinces as a frustrated and depressed character (“what right do I have to not be happy?”) it is actually quite difficult to become invested in her character, Susan, or really even care about her. This is perhaps deliberate, though, as we discover through the flashbacks her various hang-ups, insecurities and questionable decision making. However, the young Susan depicted in these flashbacks is actually quite an interesting character who battles peer pressure and who questions her own aspirations. It is the present-day Susan, though, who unfortunately is deeply uninteresting and unappealing and therefore encourages the audience to wish the film would just continue with Tony’s storyline. Matters aren’t helped by the criminal underuse of the likes of Armie Hammer, Andrea Riseborough and Michael Sheen, all of whom essentially have little more than stereotypical cameos: Hammer as the elusive husband always working late at the office and jetting off on business trips, Riseborough as the best friend who gets to worry about Susan’s lack of sleep, and Sheen as the gay art-enthusiast. Despite these cameos being relatively brief, they are representative of why this portion of the film’s narrative has flaws. Hammer, for instance, is deeply unlikable, and whilst this should bring about some compassion from the audience for Susan, they are actually so well suited to each other and they surround themselves with equally unlikeable acquaintances that it’s difficult to relate to any of them. Sheen, such a brilliant actor, is given a handful of lines only and naturally delivers them with vigour and characterisation. However, he also serves as a continuation of the art theme which needlessly recurs throughout the film and in doing so adds an air of pretentiousness to the piece. When the young Susan questioned her own aspirations, these generally related to her art and her ability, aptitude and motivation to succeed. We first meet Susan attending her own gallery opening; a scene which is preceded by perhaps the strangest opening credit sequence you’re likely to have or will ever see. Despite the popular turnout at the event and the subsequent praise for it heaped on by Sheen’s character, Susan remains deeply dissatisfied. As the film progresses we see Susan meet a handful of colleagues from the gallery, all of whom are clichés and stereotypes and none remotely interesting. Unfortunately, whereas these characters should perhaps represent external factors in Susan’s life which add to her depression, they merely serve just to add to an already dull environment and therefore whenever we do follow Susan’s trials and tribulations, you cannot help but will her to get back to the book. What saves this part of the film from being completely forgettable, though, is Ford’s excellent device in mirroring Tony’s emotions in the book with those affecting Susan as she reads it. It’s a clever touch using Gyllenhaal in a dual role here as both Edward and Tony, because as the author of the novel, Susan sees him as Tony and even pictures his wife and daughter as red heads like herself. It is these shared emotions that drive the film’s main theme of revenge; Edward deliberately seeks to make her suffer the raw emotion and pain of his protagonist in retaliation for the pain she caused him. This is visualised by Ford’s mirroring, as we see everything from anguish, fear, regret and grief etched on both Tony’s and Susan’s faces as the two stories unfold. Ford then accompanies this technique by utilising his sound effects with great skill when he parallels the character’s breathing and heartbeats, and therefore really emphasises the emotional connection between them. It is revealed to be 19 years since Susan and Tony divorced, so the question of ‘why now?’ certainly lingers over Edward’s motive in sending her the book, with the likeliest answer being that it has taken him that long to finally reach a place in his life where he is fulfilled, confident and happy. This idea of happiness and fulfilment is core to the relationship between Edward and Susan, as we discover that neither really knew how to satisfy the other emotionally and mentally. Interestingly, Ford then takes this theme as an ingredient for revenge, implying that Edward’s vengance over Susan is that he is now in a place where he has achieved his goals and accomplished success, whereas she remains miserable despite her reasons for leaving him. The juxtaposition of the two narratives therefore provides thought provoking questions about this theme of revenge. Whilst Tony’s is active and violent, Edward’s is passive and almost internal. As Tony suffers further anguish in his quest for vengeance, we don’t see Edward outside of the flashbacks and as such an omnipotence is created around him, as if he is a puppeteer pulling Susan’s emotional strings, which perhaps makes Edward the most callous out of all of these characters. Indeed, Nocturnal Animals is a thought provoking and intriguing piece of work and certainly unique in terms of story-telling as it threads hugely disparate narratives together and overtly draws out comparisons between them. Complemented by outstanding performances (Tayor-Johnson and Shannon in particular), stunning photography of the West Texas landscape and a scintillating score, it really is a hugely accomplished effort by Ford who is unfortunately just let down by weak characterisation and an undertone of pretentiousness.